This landmark collection brings Ted Berrigan's published and unpublished poetry together in a single authoritative volume for the first time. Edited by the poet Alice Notley, Berrigan's second wife, and their two sons, The Collected Poems demonstrates the remarkable range, power, and importance of Berrigan's work. 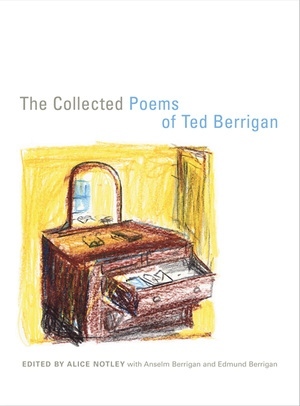 Ted Berrigan (1934-1983) was the author of more than 20 books, including The Sonnets (1964); Bean Spasms, with Ron Padgett and Joe Brainard (1967); Red Wagon (1976); and A Certain Slant of Sunlight (1988). Alice Notley is the editor of two of Ted Berrigan's books, The Sonnets (2000) and A Certain Slant of Sunlight (1988). She is the author of numerous volumes of poetry, including Mysteries of Small Houses (1998) and Disobedience (2001). Anselm Berrigan is the director of the St. Mark's Poetry Project and the author of Zero Star Hotel (2002). Edmund Berrigan is a poet and songwriter and the author of Disarming Matter (1999).